Each month Digital Signage Connection asks their members of the DSE Advisory Board a question of the month. This month, the question focuses zoning content. Here is a response from ClockNine’s Chief Creative Officer, Travis Kragh. What are some tips for zoning content? If you are in the process of considering to zone your content it’s important to understand that doing so is not ideal for every situation. Infact, zoning your content can dilute the impact of your messaging. Before our clients decide to zone content I always recommend considering CVD (Consumer Visit Duration) and average dwell time. Busy (or mobile) environments offer a limited time for us to connect. Know that by adding more pockets of information, you are creating visual competition for your messaging. In turn this can interfere with people’s ability to quickly process your information. If you have more of a stationary environment, zoning content can work; however I think it’s still important to consider the amount of information you are trying to deliver. If you have zoned content, here are a few tips to improve your ability to communicate. Limit your zones, tickers and content pockets. Don’t bombard people with information and watch your word count. People naturally process smaller groups of words more easily. The more simply you can communicate the better. Keep your zone placement consistent whenever possible. This way repeat viewers will quickly learn where to look to get the information they desire. Before designing anything, determine your visual hierarchy. Ask yourself, what’s most important for people to see? Give that zone visual prominence. Use Motion and Color Carefully. Motion and bright colors naturally draw viewers attention so use them with purpose. Limit your motion and use muted or monochromatic colors when possible. This way you can leverage bright colors and motion to highlight areas of importance. Doing this will help viewers process your most valuable information at glance. Interested in seeing reviews from other industry experts on this topic? 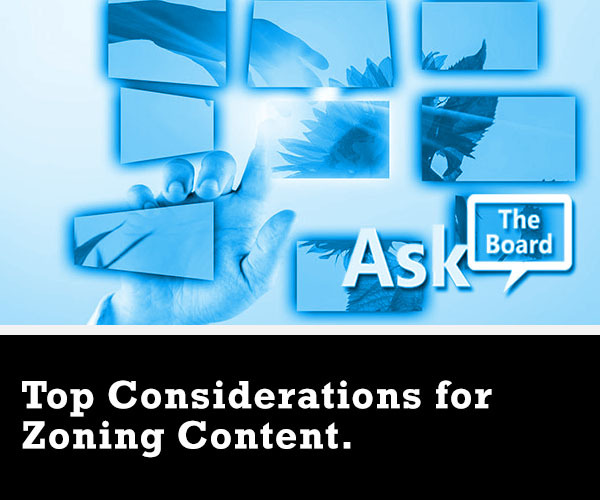 See the link below to review additional answers from the DSE Advisory Board of Advertising & Brand Council.